Looking from the Notre Dame de la Garde down upon the city of Marseille in the Provence, France in Europe. The city of Marseille is the second largest city in France, Europe and the largest commercial port. Marseille, France was founded by the Greeks in the 7th century BC and to date is the center of a large metropolitan area which is spread across a wide geographical area.The city of Marseille in France, Europe is dominated by the port which handles millions of tons of freight annually. The major imports of Marseille include petroleum, wine, fruits, olive oil, hides and skins and tropical agricultural products. The major exports are wines, liqueurs, processed foods, cement and metal products.The city of Marseille, France has some very intriguing historic sites to visit and the list of sports are endless. The city is full of fantastic restaurants, cafes, night clubs, museums and theaters which is just a beginning of the many things to do in Marseille, France.City of Marseille seen from the Notre Dame de la Garde, ND de la Garde, Bouches du Rhone, Cote Bleue, Blue Coast, Mediterranean, Provence, France, Europe. 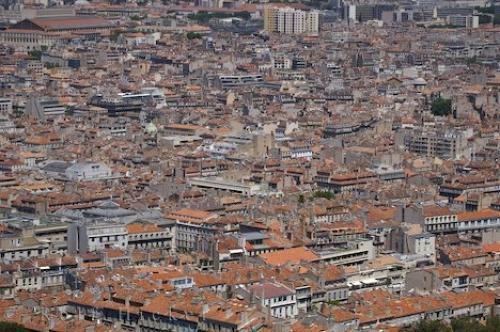 Photo of an overhead view of the city of Marseille in the Provence, France in Europe.